Super Bowl Propstravaganza! Day Five: Who Will Be Penalized First? With Super Bowl XLVIII just two weeks away, we are all about to be inundated with ridiculous and hilarious prop bets spanning every aspect of the game day experience. In Part Five of a multi-part series, we try to figure out which team will be the first one penalized in Super Bowl XLVIII. Prop: Which Team Will Have The First Penalty? This is a great prop, because it's a total guess. Who the hell knows which team blows an assignment and is forced into a holding call, or which guy starts to fall forward in his three point stance and gets called for a false start. But we can sure as hell try to figure it out! First of all, some clarification. This prop is only counting penalties that are accepted by the opposition, so a penalty that is declined in lieu of a more favorable result will not be good enough to win this one. As for each team's results in this realm this season, it seems like the odds should be skewed a little bit towards Seattle being called for a penalty first. 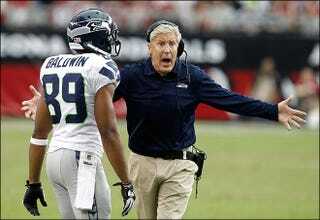 The Seahawks were the second most penalized team in the NFL this year with 138 penalties. Denver, meanwhile, finished tied for 16th in the league with 101 penalties, an average of nearly two penalties per game fewer than Seattle. Seattle committed the first penalty in ten of their 18 games this season, while Denver only did so in eight of their 18. While these numbers mean very little here, any small edge can help when looking to make a little money. The data says that Seattle will commit the first penalty on Super Bowl Sunday.